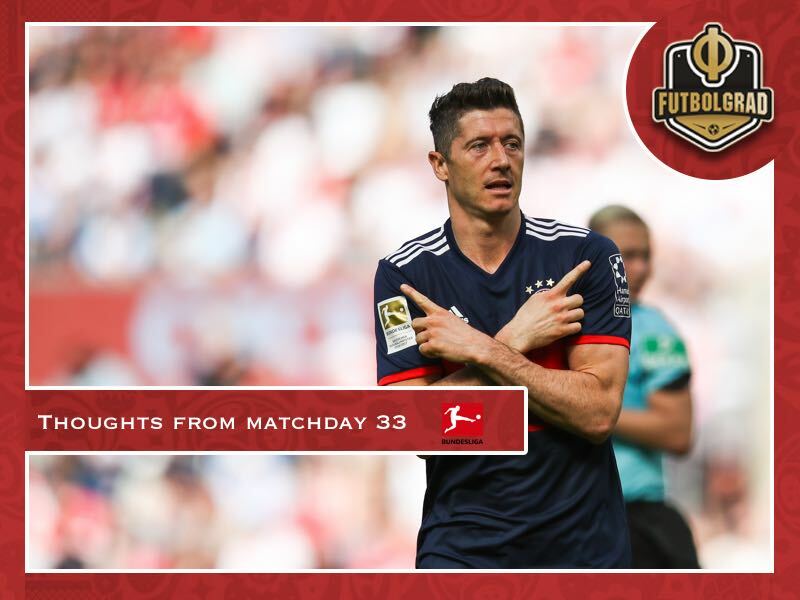 As the dust settles from matchday 33 of the German Bundesliga, Manuel Veth brings you their view on what was learnt, and in some cases – already known – ahead of the all-decisive matchday 34. Bayern remain all-conquering. Despite going out against Real Madrid in what was a closely fought affair on Tuesday night, Bayern remained focused on the league. Facing already relegated 1.FC Köln it was the Billy Goats that took the early lead and held on to it until halftime. In the second half Bayern, however, went up two gears and dismantled Köln. Thomas Müller first assisted James and then Robert Lewandowski, who scored his 29th goal of the season and could once again finish with more than 30 goals. Corentin Tolisso then scored the final goal to make it 3-1 for Bayern. But it was Lewandowski, who captured the headlines. For months there have been rumours that the Polish forward wants to leave Bayern to join Real Madrid. Upon his substitution, he refused to shake Jupp Heynckes’ hand putting fuel on the fire that the striker could force a move to Real Madrid in the summer. Hot, lukewarm, and cold is the best way to describe Dortmund’s last three matches. Fantastic against Leverkusen Dortmund seemed to be destined to secure a Champions League spot after beating the Werkself 4-0. That performance was followed with a 1-1 draw against Werder last week where the Yellow and Blacks played well but could not hit the target. Thanks to the Werder result Dortmund needed one point on matchday 33 to wrap up a Champions League spot. But Dortmund disappointed losing 1-2 at home to Mainz, who in turn saved themselves from relegation. 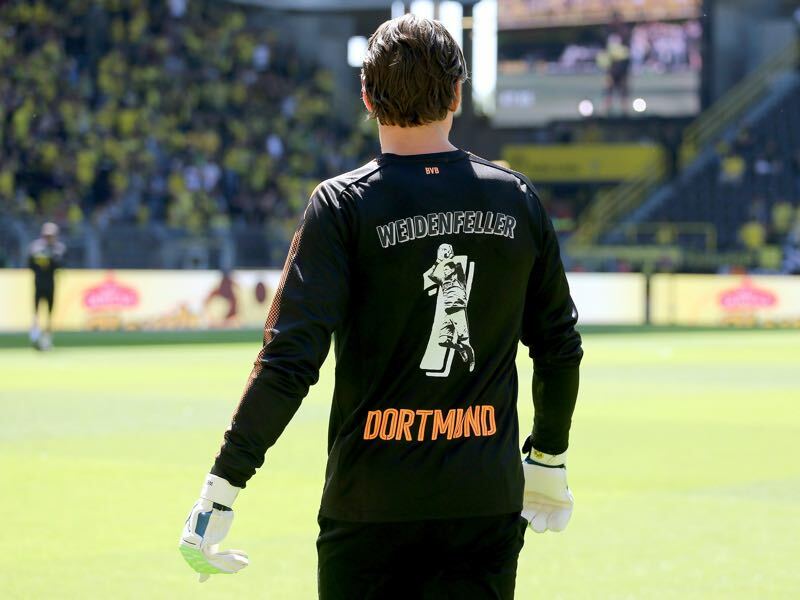 It was a match that was supposed to be a celebration for Roman Weidenfeller. The 37-year-old will hang up his boots at the end of the season and will be replaced by Augsburg’s Marwin Hitz. But Weidenfeller’s retirement party was overshadowed by Dortmund’s bad performance and Sebastian Rode’s statements that suggest that Peter Stöger could be leaving the club. BVB CEO Hans-Joachim Watzke has since told kicker that there will be consequences following Rode’s statements. Dortmund will need one point on matchday 34 to be 100% ensured a Champions League spot, but with all the controversy going on at the club it is difficult to imagine that the Yellow and Blacks can get their act together. Dortmund, Hoffenheim, Leverkusen and even Leipzig are fighting for the two final Champions League spots. Dortmund, despite all the noise at the club, are likely to lock down their spot. The Yellow and Blacks will be facing Hoffenheim, but three points ahead of both Hoffenheim and Leverkusen with a six-goal bigger goal difference to fifth-place could even afford a defeat on matchday 34 and still qualify. Hoffenheim, in the meantime, need to play for all three points against Dortmund to be sure to reach the top four. Coached by Julian Nagelsmann the club from the Kraichgau will be aware that Leverkusen will be playing Hannover 96, who have nothing left to play for and Leverkusen will likely collect all three points. Leipzig are the biggest outsiders. Facing Hertha in Berlin, however, die Roten Bullen have an easy opponent and defeats for Hoffenheim and Leverkusen could return Leipzig to the Champions League group stage. Either way the Champions League race remains exciting as the league heads into the final matchday. Hamburg had a significant opportunity to claim out of the direct relegation zone. With Wolfsburg being dismantled by Leipzig Hamburg seemed to take the chance to reach 16th spot, which would qualify the club for the relegation playoffs. But an early goal by Tatsuya Ito was ruled off by VAR and Frankfurt then took the lead themselves and never looked back winning the game 3-0. The result means that Hamburg need to win their final game against Gladbach and hope that Wolfsburg are defeated by already relegated Köln. It will be a difficult task for the only club in German football that has never been relegated. 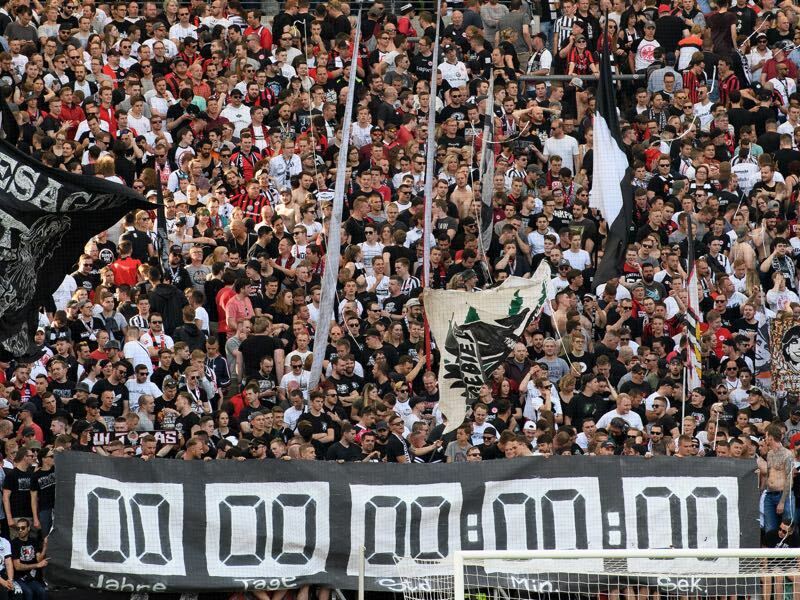 Many in Germany, in fact, hope that Hamburg will finally face relegation and Frankfurt fans held up a banner that showed Hamburg’s famous clock, which is counting up the club’s time in the Bundesliga, set to zero. Whether Hamburg’s time will be finally up will be decided on matchday 34.